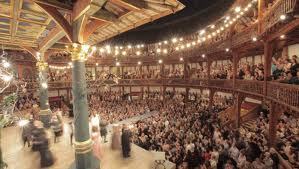 The globe is a theatre in London. It was build in 1576. The owner was James Burbage for 21 years. The theatre is an open air theatre which means it doesn't have a roof. The theatre originaly stood on one side of the river Thems but it was stolen and removed to the other side of Thems. The walls are 12 meters tall and covered in lime plaster. Three-thousand(3000)people can fit in the globe. At the start it was called "the theatre" but as more theatres were build in London it was changed to "the Globe theatre" because of its round shape. The floor was covered with litter. Oak beans were used to construct the buildind. The stage was a rectangular shape;a dozen actors could fit on it.